The Cabinet of Ministers has approved a resolution establishing an interdepartmental commission for the protection of business, headed by Prime Minister Volodymyr Groysman. "The commission will consist of an absolute majority of business associations and human rights defenders, there will be no law enforcement agencies," Justice Minister Pavlo Petrenko, presenting the decision at a Cabinet meeting on Wednesday, said. The commission, in particular, will monitor the implementation of the law "stop mask-show! ", which the parliament adopted in 2017. It will deal with cases of violations of business rights, including searches, said the Minister of Justice. Petrenko also noted that the commission would work in public mode and its work implies a systemic response of the government with regard to changes in legislation or personnel decisions. The resolution also contains recommendations that are obligatory for implementation by law enforcement agencies. 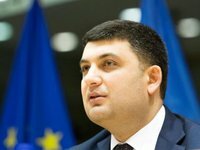 Groysman suggested holding the first meeting of the commission in March on the situation with the pressure on business from the side of the security forces. He also added that the commission included a business ombudsman, the Union of Ukrainian Entrepreneurs, the European Business Association, the American Chamber of Commerce and Industry, representatives of trade unions, the Federation of Employers.